We all were happy to the core to throw out a party to dear and near ones for this special day. We planned to have celebration on the birth date itself even though the date falls on weekday! Her Ayah had taught her that July 2nd is her birthday and she started telling this to everyone and happily invited them for the party. We had planned to celebrate her birthday on the hall which was readily available on our Apts itself. Morning some how she woke little early than usual and took bath nicely! I made her to wear new dress and when I asked her what was special today, she told, "Happy Birthday Enaku". It was so lovely to hear this. After breakfast, We went to near by temple and did "Archanai" for her. Thamizhini was not very much aware that we have a party tonight for her, even though she had attended many birthday parties. We partially prepared food for the party and order few items from outside to reduce our burden in the evening. My friend Lakshhmi came early with her kid Gayathri to the party and she was helping us in preparation. 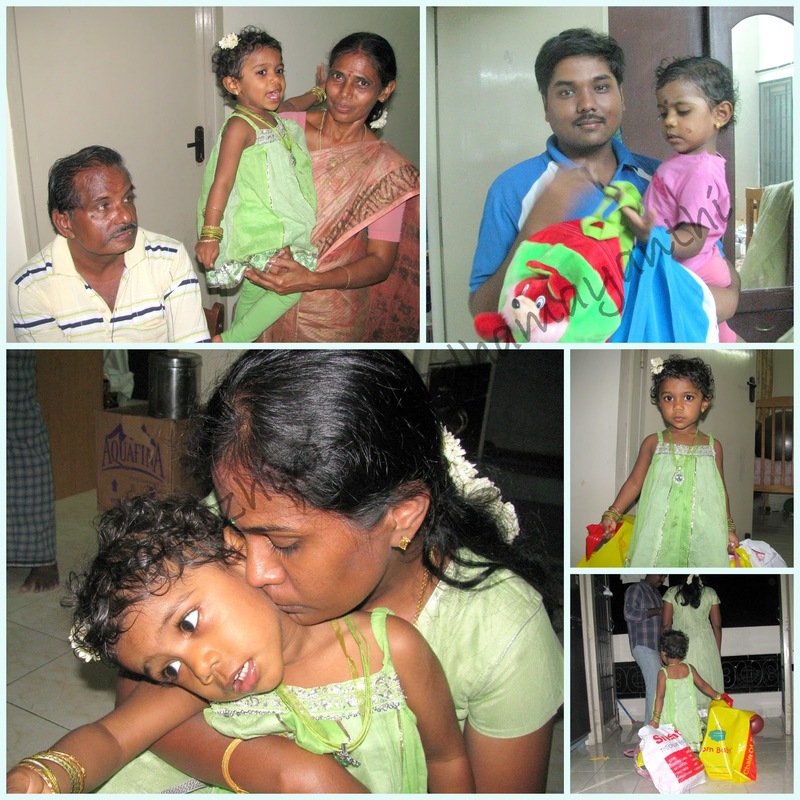 I dressed Thamizhini with cute salvar set and she very much liked to wear it. She liked that Dupata very much and sometimes she used to take mine and wear. As this was her first Salvar, she was very much happy to have that Dupata on her. 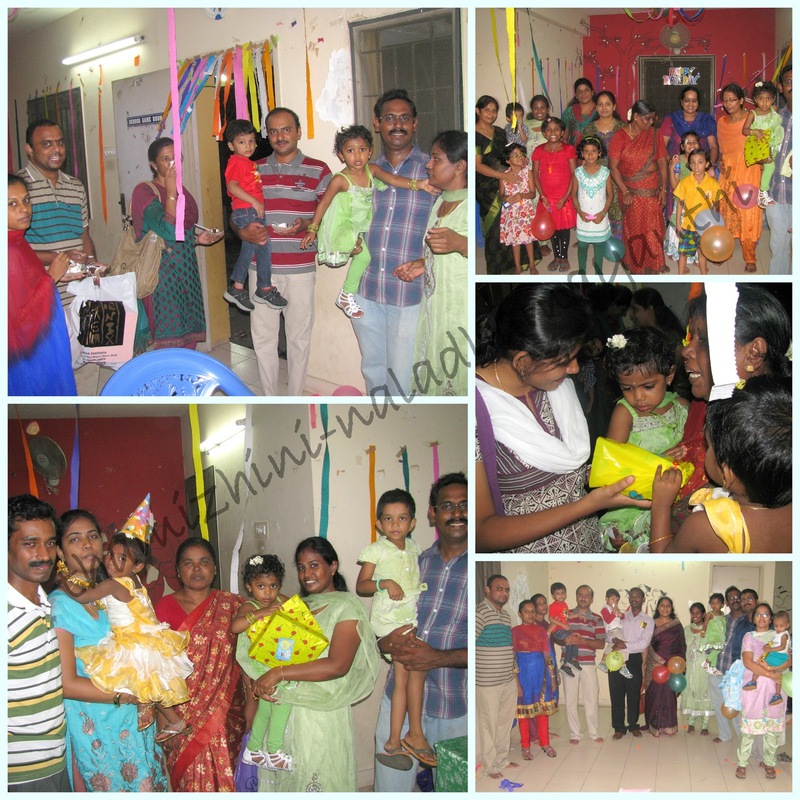 We all were ready by 6pm and moved to the party hall which located in our block. 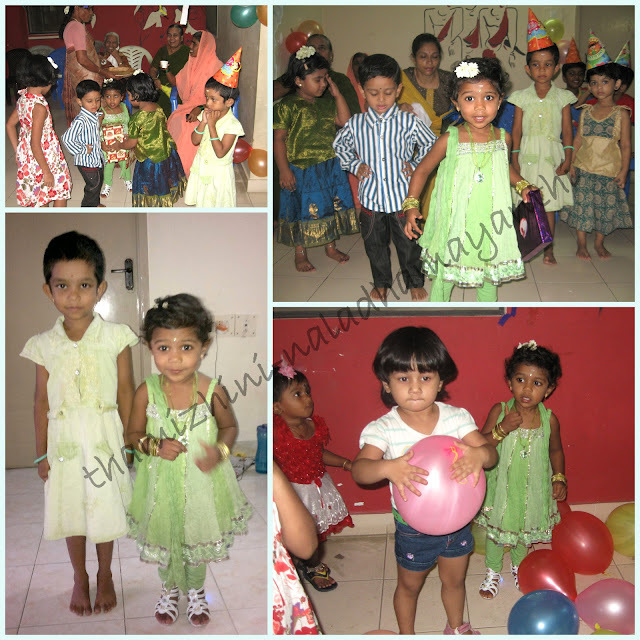 There were many kids on the party and all were enjoying and playing with balloons and color paper. 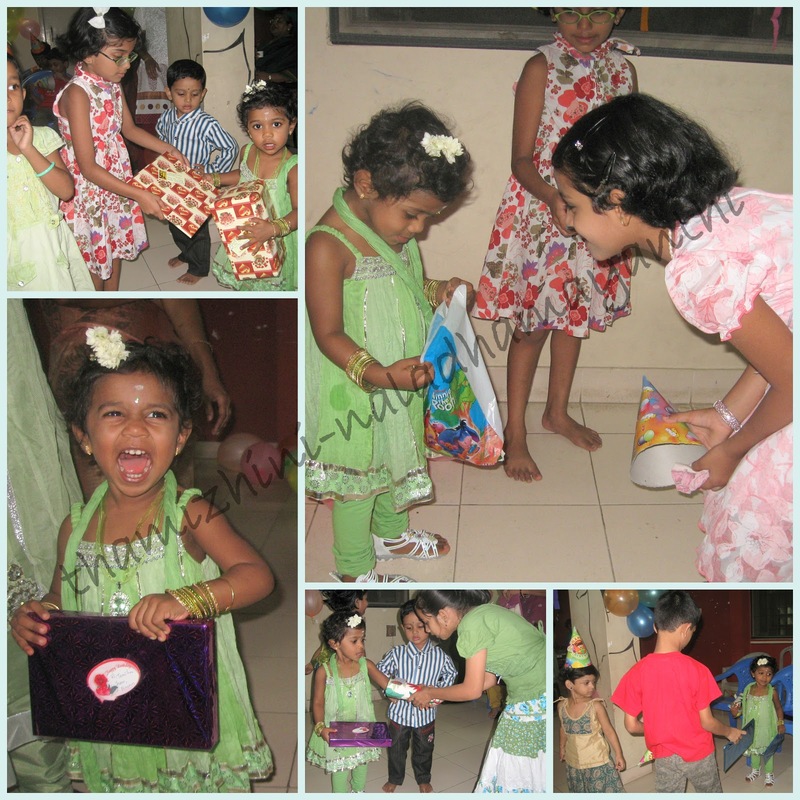 Thamizhini was in full of joy and I guess she felt that she was center of attraction as all kids were coming and giving gifts to her. She was happily collecting gifts and never worried about who is giving her :D She would have thought collecting is her only duty on that day! Me and Nalin invited few of our friends from office and rest all are Thamizhini's friend in the Apartment. I was not knowing few of her friends, but she was happily calling them and playing around there. We have ordered Brown bear (yeah, Brown bear Brown bear, what do you see?) cake and it came out really well. 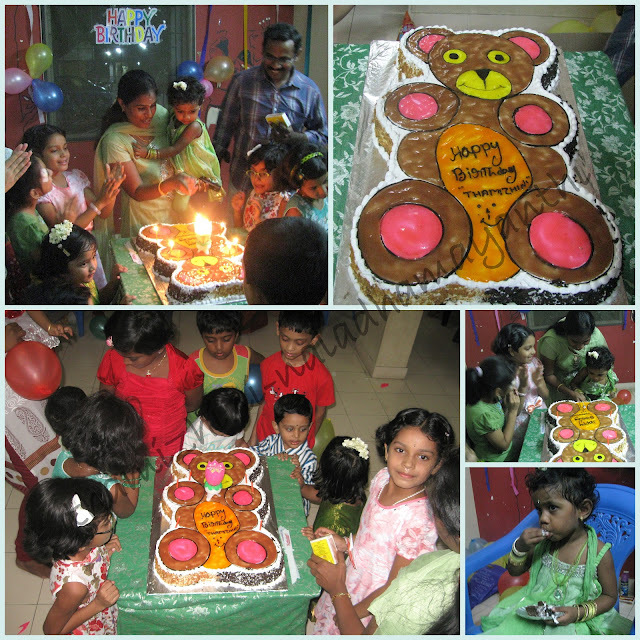 All kids were very happy to see that Bear cake and all were waiting to cut the cake. We cut cake by 7:30 as most of the invite have come in time. It was really wonderful to have all kids around the table and all were happily singing happy birthday to Thamizhini! We can celebrate each birthday like this just to have all kids around us. Dinner started soon after cake cutting and my friend Lakshmi helped to serve better. She gave idea of keeping all food in order so that it will be easy to serve without missing any of the items. 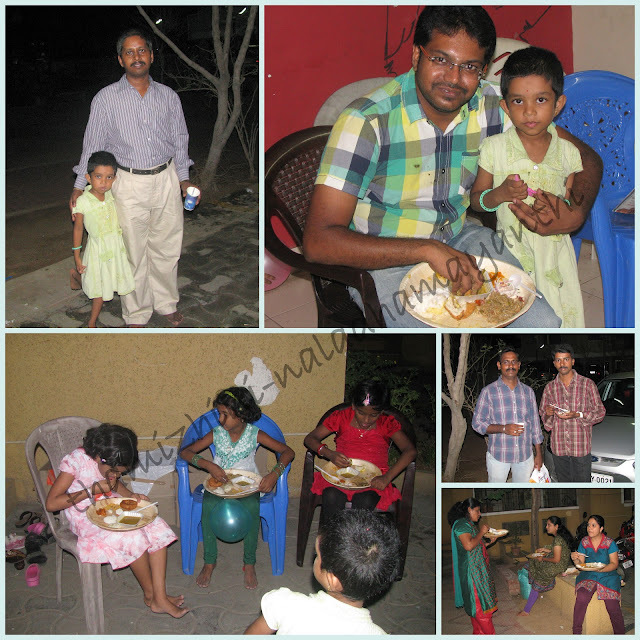 Kids were enjoying drinks and cake where elders had their dinner relaxedly! The party was over by around 9:30 and we came back to house after light cleaning of the room by 10pm. 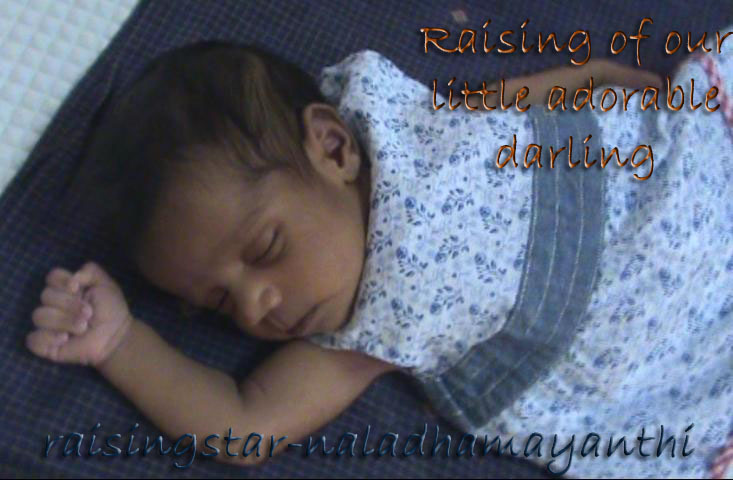 Thamizhini was damn tired but still she was not ready to go to sleep. She really does not have any idea about the gifts and did not ask us to open it also. Even we felt not to open now as we all were very much tired and we thought we could not surely control Thamizhini. She was simply carrying all the gifts and covers and was roaming here and there in the house.